As expected, Digital Britain is committed to broadband for everyone - but not very fast broadband. The Universal Service Commitment will deliver 2Mbps to everybody by 2012, using a combination of fixed-line access, mobile access and possibly satellite access too. To help pay for it, £200 million will be grabbed from the digital switchover underspend and there will be "contributions from other public sector organisations." The government agrees that there's a real risk that high-speed broadband - such as Virgin's 50Mbps offering - won't be available to everyone, but it doesn't want to distort the market. As a result, it wants to create a Independent Next Generation Fund based on a 50p/month tax on each fixed copper line. This money will be earmarked to ensure that fast broadband reaches "the final third" of homes, and the report's target is 90% market penetration by 2017. Digital Britain also proposes that housebuilders should "ensure they embed next generation broadband in their plans" and that the government investigates the use of overhead lines to reduce installation costs. The government accepts the recommendations from the interim report, which called for timely clearance of the 800Mhz spectrum band released by TV's digital switchover, reducing networks' grip on existing 2G spectrum and expanding 3G licences indefinitely instead of keeping them to fixed terms. "Some details remain to be verified", but OFCOM will play a role in ensuring networks share resources to improve coverage. DAB's a bit of a disaster so far, so Digital Britain proposes making all our national broadcast radio stations digital-only by 2015. The government will work with the car industry to make sure the majority of cars have DAB receivers by that date, and with the BBC to ensure DAB coverage is at least comparable to FM coverage. Surprise surprise, the government doesn't want to criminalise file sharers with an election looming. Instead. Ofcom will make ISPs do two things: notify users if they're being naughty, and for repeat infringers follow "a court-based process of identity release and civil action." If those don't work, the government expects ISPs to implement bandwidth reduction or port blocking. Previously Digital Britain acted as if the UK games industry doesn't exist, so it's nice to see that "the government has… committed to work with the industry to collect and review the evidence for a tax relief". Anything that stops the games industry brain drain sounds good to us. 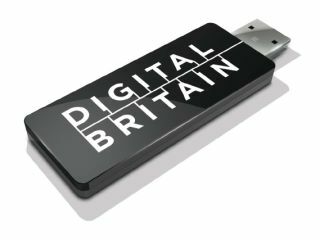 If the Universal Service Obligation means everyone's got broadband, then digital government might be possible - so Digital Britain recommends that "online will become the primary means of access" for government services, albeit with some kind of "safety net" for those unable to access the service online.